Time flies by so quickly these days that I find myself utterly surprised when the seasons suddenly sneak up without giving me a chance to prepare stylistically for them. In order to avoid being unprepared for the rainy season on the east coast this fall, I felt it'd be wise to start taking stock now of must-have rain essentials that I will need. 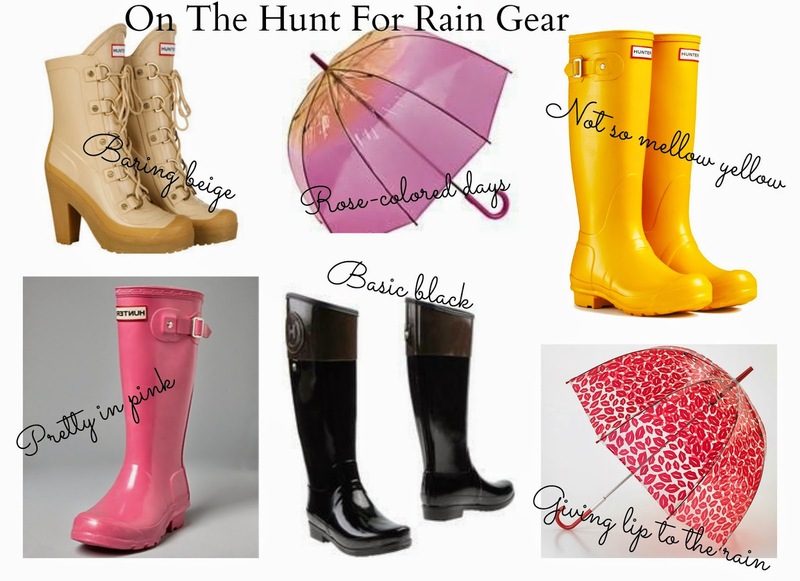 For one, Hunter boots are definitely high on my list for their full-proof practicality on those torrential downpour days, and last but not least, sturdy umbrellas that will fight back those merciless winds without being blown outward leaving me and my hairdo looking like a stunned wet cat. 1. Gabby Wellington Boots "baring beige" will not only be great on rainy days but will assure a tight grip for walking when that rain turns into ice. 2. Transparent Pink Birdcage Umbrella will help to have rose-colored days instead of gloomy ones. 3. These not so mellow Yellow Hunter Boots bring the right amount of sunshine on the days it's most needed. 4. Aah, pretty in Pink Hunter Boot just makes me feel so girly and reminds me of the big square bazooka gum I chewed so much in high school. 5. Black Hunter Boots for those 'wanna be serious' kind of days. 6. Now on the days you just want to give lip to the rain without uttering a word, this Large Birdcage Red Lips Umbrella is your perfect companion.